Ultimately, the result of this one was all-important, with the Bulls snatching a late leveller to ensure League football for another season. The point gained, together with results elsewhere, means that the outcome of next week’s end of term trip to Moss Rose will be academic. As a spectacle, this afternoon’s business, played in bright sunshine, but with a tricky wind, was a nervy, disjointed affair with a paucity of lively action. Panic seemed about to set in when Bradford converted a late penalty, but Stuart Fleetwood equalised with a direct free kick minutes from the final whistle. 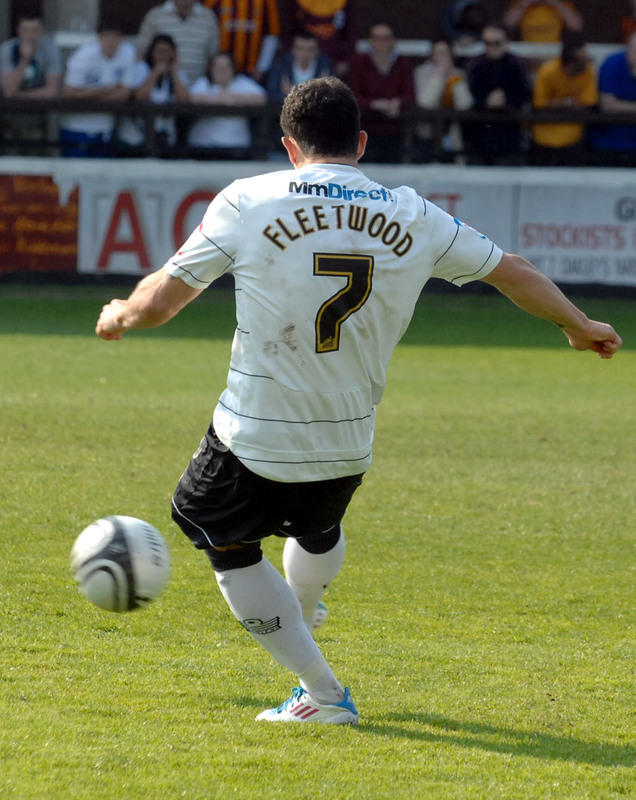 Fleetwood's free kick hits the post and goes in - pictures from Andy Compton of the Hereford Journal. David Syers made an acrobatic attempt to open the scoring for the visitors, clad in their traditional “egg and bacon” strip. Adam Bartlett watched as the shot drifted tamely wide. Fleetwood then drew a foul from Ex-Bull Robbie Threlfall, and John Leslie’s free kick was cleared by Luke Oliver. Fleets then misplaced a pass and the speedy Omar “He’s Making Eyes At Me” Daley got free from Ryan Green. The pass was collected by Jake Speight who forced Bartlett into a confident stop. Again the in-form keeper denied Daley by claiming a hanging cross at full stretch. Joe Colbeck embarked on a purposeful run, and a neat move involving Rob Purdie, Leslie and Kenny Lunt did not finish with a shot on target. Another move involving the same cast once more lacked the final, telling delivery. Nicky Featherstone then raced onto a through ball and went to ground in the area, and a hopeful appeal for a penalty was waved away. Lunt and Featherstone played Purdie in, but a timely intervention by Lee Bullock prevented a shot. Colbeck unselfishly cut a ball back for Fleetwood, which fell just behind the striker. After a quick piece of counter-attacking from the Bantams, Gareth Evans’s long range effort cleared the bar by some margin, and just before the interval Daley was able to waltz unchallenged through the centre of the park, though this too came to nothing. After the break, Daley’s cross took a wicked deflection which Bartlett kept a wary eye on to make the save. Speight was then thwarted by Joe Heath with a well-timed tackle. Stefan Stam then pulled Speight back just outside the box, avoiding what seemed an inevitable card, and the resulting free kick was headed clear by Michael Townsend. News that Accrington had taken the lead against Barnet was greeted with the afternoon’s biggest cheer thus far. Neither side had troubled the opposing goalkeeper, as the game became littered with misplaced passes. Leslie turned cleverly inside to set up Fleetwood whose shot from an angle had too much altitude. At the other end, Syers’ attempt lacked power and direction. Bartlett’s wind-assisted clearance was mis-read by Oliver, but the giant defender recovered in time to give away a corner, just before Colbeck, the subject of some banter from visiting fans, could intervene. Bantam banter? Then a Fleetwood drive was beaten to safety by Lenny Pidgeley. The game seemed destined to remain goalless as fans’ reacted to news from elsewhere on the scoreboard, and calculated what each new goal meant in terms of the league table. Waide Fairhurst did well to direct an awkward header goalwards, but Pidgeley scooped the ball round his post. Just 9 minutes remained when James Hanson, a master at playing the simple ball, collected a return pass and ran into the area. Before he could cut it back, he was clearly pulled back by Stam, and referee Mr Phillips had no hesitation in awarding a penalty. Speight stepped up to slam the ball past Bartlett. For a few minutes, Hereford seemed to go to pieces, giving the ball away cheaply and not achieving any fluency in their moves. Then with 87 minutes on the clock, the desperate Bulls were handed a lifeline. Fairhurst went on a marauding run, only to be checked on the edge of the box by Lewis Hunt. Fleetwood assumed control of the situation. Taking the kick himself, and ever mindful of his recent goal drought, our Stu lashed an unstoppable drive into the far corner of Pidgeley’s net. The relief shown by the team, management, and the fans was palpable. Attendance: 3219, including 254 Yorkshiremen. HUFC: Bartlett, Green, Townsend, Stam, Heath, Leslie, Purdie (Fairhurst 58),Lunt, Featherstone (Kovacs 90), Colbeck (Patulea 86), Fleetwood. BRADFORD CITY: Pidgeley, Oliver, Hunt, Threlfall, Daley (Williams 82), Worthington, Bullock, Syers, Evans (O’Brien 59), Speight (Dean 90), Hanson. Forest Green retained their Conference status despite a 2-1 loss at Tamworth in the final round of matches. Ex-Bulls Steve Guinan and Neil Mackenzie made late sub appearances in the match that saw both teams survive. The Gumpers survive only thanks to Southport's loss at Kettering that saw the Sandgrounders down instead, with Altrincham joining them after a 4-3 home loss to already relegated Eastbourne. Mark Beesley scored twice for Alty. Result of the day came at Gateshead, who were thumped 7-1 by Newport. Gateshead had keeper Tim Deasy sent off and had no replacement on the bench. They led 1-0 at the time but Newport scored with all seven of their subsequent shots on target. Here are the main stats from this afternnon's League Two match at Edgar Street where Hereford United and Bradford City drew 1-1. Referee: David Phillips had a good game and appeared to get all of the main decisions correct. Sponsors Man of the Match: The Hereford Times gave the award to captain Michael Townsend. Attendance: 3219 with 254 from Bradford. David Keyte, the Hereford United chairman, is delighted the Bulls will be in League Two again next season as relegation would have cost the club £500K. "I think when we look back over our first year it's been quite a journey," Keyte told BBC Hereford and Worcester. "In all honesty we probably made one or two wrong turns and had to reverse out of cul-de-sacs but yes it's nice to get over the finishing line. "I would like to say I thought the crowd was superb today. "We always thought there were 3,000 people wanting to come out and help us and they were here today, Great Day. "Since Christmas Jamie Pitman and the team probably couldn't have given much more than they have. "In the last couple of months he's fallen on a formula based on the players he'd got, the 4-5-1. No pretty at times and I think Stuart Fleetwood in the last four or five matches has been out on his feet. But it was working. "Jamie is his own man which I think will stand him in good stead. "Had we lost the Football League grant that's about half a million pounds a year we would be worse off. With just a couple of minutes left in the game Stuart Fleetwood scored a free kick for Hereford United that has kept them in the League. "Delighted, one of the best feelings of my career," Fleetwood told BBC Hereford and Worcester. "I don't usually take free-kicks but I said to Kenny 'do you mind if I take it' as I fancied it. "Luckily I hit it perfectly and it's gone in off the post. "It had to be right in the corner, I think it was too close to go over the wall. So I had to hit it with a bit of pace. To beat the goalie in off the post was fantastic." It's been a tough start as a manager for Jamie Pitman, pictured with his two children after the game, but this afternoon's point at Edgar Street against Bradford was enough to ensure Hereford United will play in League Two again next season. "We made it tough but we're delighted," Pitman told BBC Hereford and Worcester. "I think as much as anything we're just all relieved. "It's been a really tough season. It's been stressful, painful, a roller-coaster ride of total emotions but it's the best job in the world. "I've got to thank my players, Dave Kevan, Houlty especially who has kept me going constantly all the time. He doesn't get enought credit for what he does. "Bradford came here needing another point and they stifiled the game. Made it difficult but in general we dealt with most things. "We gave the goal away and you're thinking - nightmare. It was a penalty. "But Stuart, who has had a terrific season for me, has come up trumps with a decent free kick." With Stockport's relegation confirmed by their 2-0 loss at Crewe, the final day comes down to a shootout between Barnet and Lincoln. The Imps surrendered a goal lead to lose 2-1 at Oxford, while Barnet lost 3-1 at Accrington. Barnet face Port Vale on the final day needing a win. If they do, so do Lincoln as their goal difference is so poor a draw would not be good enough. The Imps face Aldershot at home in their final match. The Bees' loss means the Bulls are safe after their point against Bradford. Also safe are Northampton after beating Stevenage 2-0, and Burton after they drew 1-1 with Southend. At the top Chesterfield need only a point to secure the championship. Their goalless draw with Torquay last night opened the door for Bury to take charge, but the Shakers lost 3-1 at home to Wycombe to blow their chances. The Chairboys are third but still need a win next weekend to secure an automatic promotion spot after Shrewsbury won 1-0 at Cheltenham to keep up the pressure in fourth. Accrington's win secures their play-off place, with Torquay, Stevenage, and Gillingham fighting over the final two spots. The Gills went down 4-2 at home to Macclesfield to leave them out of the top seven on goal difference. Port Vale have an outside chance, but would need a cricket score to make up the goal difference, after beating Morecambe 7-2 today. That score included hat-tricks for Justin Richards and Louis Dodds. Rotherham's dismal end to the season continues with a 2-2 draw with Aldershot to see them down in tenth. At the foot of League One both Bristol Rovers and Plymouth can only escape relegation on goal difference alone. With relegated Swindon going down 2-0 at Oldham they will finish bottom of the pile. The Pilgrims are six points short of safety with two games left after losing 1-0 to near-rivals Exeter, and will be relegated if they fail to beat Southampton on Monday. The Pirates drew 1-1 with Sheff Weds leaving them needing to win at Colchester by around 16 goals. Dagenham beat Carlisle 3-0 to move up to 47 points, one behind Walsall who beat Charlton 2-0. The pair can both overhaul Notts County after the Magpies lost 2-1 at MK Dons. The Bulls confirmed their League place for next season with a nervy 1-1 draw with Bradford. Jake Speight's goal from a needlessly conceded penalty left the Bulls nerves shredded, but Stuart Fleetwood equalised from a free kick and, with Barnet losing, the Bulls were safe. Stuart Fleetwood almost swept the board at the Player of the Year awards announced today. The Bulls top scorer won the main Player of the Year prize, the Junior Bulls award, and the Away Travel award. Adam Bartlett won the Community award. Port Vale are looking for a new manager after a disappointing end to a season following a promising start. Former manager Jim Gannon was sacked last month after a short period in charge. Chairman Bill Bratt has reportedly received over 50 applications for the job. However whilst they intend to start interviewing candidates shortly, one of their possible targets, John Coleman, is unable to commit whilst Accrington are in a play-off place. "We will appoint someone when we find someone of the right calibre," Bratt told the Sentinel. "We have already started the appointment process and we plan to start contacting people and conducting interviews next week. "The majority of applicants are not up to scratch, but there are a few names in there that might excite the fans. "We will also approach managers who haven't applied, and we have three good people in mind." Meanwhile neither Bratt or anyone else on the Port Vale board will be at their last home game of the season this afternoon. Protests are planned by some supporters. "We're not going because our security staff, who liaise with the police, say it would help defuse the situation if we weren't there," commented Bratt. Hereford United are hopeful that a good crowd will get behind them and help secure a win against Bradford City at Edgar Street this afternoon. Three points will secure their place in League Two next season, provided one of the three teams below drops a point, whereas just a point could mean that, depending on results elsewhere, the Bulls may need points from their final game of the season next Saturday at Macclesfield to stave off the threat of relegation. Chairman David Keyte has taken the unusual step of reducing prices for those supporters who prefer to stand, either in the Meadow End or the Len Weston terrace. Admission this afternoon will be £10 for adults, £5 for seniors, and just £1 for those under 16. Seated prices remain unchanged. Keyte's aim is to get as many supporters to the game as possible in the hope that the extra noise they can make will spur on his team to victory. Manager Jamie Pitman backed the decision. "The club have reduced prices to hopefully get some more people in," Pitman told the Worcester News. "It’s our last home game so we hope everybody comes out to support us and help us over the finishing line." Visitors Bradford City are almost certainly safe from relegation. However no doubt they will be mindful that a point will ensure League Two football for them next season. Meanwhile Torquay moved back into the play-offs after drawing with leaders Chesterfield last night. Their point will put extra pressure on Accrington, also in the play-off places, to take all three points from their game against Barnet this afternoon. For those unable to get to the game, there will be full commentary on BBC Hereford and Worcester's 94.7FM frequency and also commentary on Bulls Player. A second MP has questioned the fairness of the Bulls being deducted three points for playing an ineligible player. Damian Collins, MP for Folkstone and Hythe, went to school at Belmont Abbey - the Bulls' old training grounds - and sits on the Parliamentary committee that is investigating football governance at the moment. In a letter to the Football League's Chief Operating Officer Andy Williams he wrote: "I would be interested to learn of the Football League's reasoning in docking three points from Hereford United but only one point from Torquay United for the same offence committed during the same match. "Should not the penalty have been equal for both teams? 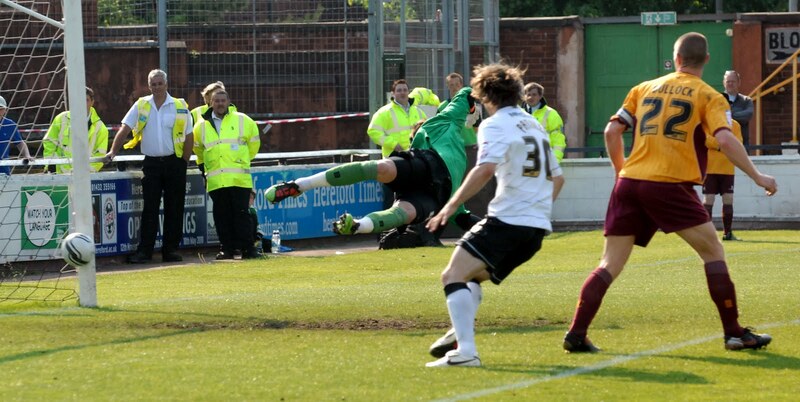 It also seems to be a particularly significant issue for Hereford, as they may be relegated as a result. This seems to be a harsh and disproportionate penalty in the circumstances." "This seems to be a genuine oversight by Hereford but if sanctions are to be imposed then surely they should at least be consistent. There seems no reason for Hereford to be docked three points and Torquay only one for the same offence." The Bulls make their last trip of the season next Saturday, 7th May, when they visit the Moss Rose for the final League 2 match of 2010/2011. The HUISA coach will leave Radford's at 9.30 am and seats can be booked in Radford's before the Bradford match or through the Club office (08442 761939). Fare is £18 (members £16). Bradford temporary boss Peter Jackson made his debut at Edgar Street. Back in March 1979 the then 17 year old started his first game for the Bantams in their 3-1 loss at Edgar Street to Mike Bailey's Bulls. In the home side that day was newly appointed Head of Youth John Layton - who scored the second goal - as well as Edgar Street stalwarts Tommy Hughes, Steve Emery, and Chris Price. Jackson played 391 times for Bradford, and rejoined his hometown club as manager two months ago. In twelve games so far he has collected four wins, but doesn't know if he will be in charge after the final two games of the season. He told the Telegraph and Argus: “My main aim was to keep the club safe and I’ve almost done that. I don’t know what happens after the last game. "As far as I’m concerned, I’m just here week by week. I haven’t signed any agreement with the club. But I’m sure they will decide soon. They need to for everybody’s future so we can look forward. There are 11 or 12 players out of contract and I need permission from the board to go ahead and do the retained list. Decisions have to be made on and off the field." Jackson will face the Bulls again without influential midfielder Mike Flynn after he damaged a hamstring on Monday. Loanees Tom Adeyemi and Kevin Ellison are also doubtful with thigh problems, although Jon Worthington is expected to be fit after damaging a foot against Aldershot. The midfielder, like the Bulls' Rob Purdie, was released by Oldham in January and signed a deal with the Bantams until the end of the season. Wrexham have confirmed they have cleared their £200,000 tax bill. They will face Luton in the Conference play-offs, with AFC Wimbledon facing Fleetwood Town. Lincoln have booked up seven free coaches to take fans to their crunch relegation match with Oxford. Just over 350 fans have taken up the offer of free travel as the Imps look to end a run of just one point from eight matches. 500 Port Vale fans are expected to march to the stadium in a mock funeral tomorrow. Staffordshire Police have taken the unusual step of posting on the One Vale Fan forum asking for the organisers of the march to get in touch. Valiants director Graham Mudie has resigned this morning. Cheltenham striker Wesley Thomas has said he will speak to other clubs before deciding on his future. The 19 goal frontman would prefer a club closer to his London home. Crewe are reported to have offered a two year deal to Port Vale defender Gareth Owen. The 28 year old central defender has also been offered a deal by the Valiants but is reported to be frustrated at the club's managerial situation. Swindon are reported to be considering former Bristol Rovers boss Paul Trollope for their vacant managerial post. Trollope's father played for the Robins for 20 years and also managed them. Plymouth bidder Paul Buttivant has confirmed he has lodged a bid for the club, complete with the proof of funds missing from his previous offer. His offer is based on a commercial redevelopment of land surrounding Home Park. Notts County boss Martin Allen says he has already agreed to sign two new players for the club next season. While no contracts have been signed, Allen tells the BBC: "I've already got two verbal agreements and once they do verbal with me they don't normally back out." Rushden have been docked five points for misreporting their financial details to the Conference last season. They have also been handed a suspended £2,000 fine. The Diamonds have asked club creditors to a meeting next Wednesday where the board will outline the club's financial situation after they were handed a winding up petition by a catering company. The Bulls entertain Bradford City on Saturday in their final League Two home game of the season. The two sides met at Valley Parade back in December, when a Dave Syers goal early on was the matchwinner for the Bantams. The away side hasn't scored in any of the last three games between the two teams, with the previous trip to Valley Parade also ending 1-0 and the match at Edgar Street last March ending 2-0 to the Bulls with Mathieu Manset and Jake Jervis providing the goals. The Bulls will be looking for a win to put to bed any relegation fears, but will need to up their prowess in front of goal. They have scored in just two of the last seven games but have been consistent in picking up draws from games they would have previously lost thanks to a resolute defence and some stunning work from Adam Bartlett. Stuart Fleetwood is the man to provide the goals after 16 this season, but he has netted just twice in the last 13 games and will be desperate to add to his tally on Saturday. The Bantams secured their League Two status with a win over Aldershot last Monday, but a foul air lingers over Valley Parade as their continued existence in League Two threatens their very existence. With warning from the boardroom that the club is on the verge of bankruptcy if they continue life at the foot of the Football League, temporary manager Peter Jackson has seen the side he inherited slide further down the table. Midfielder Dave Syers is top scorer with just eight League goals, while combative striker James Hanson has contributed only six in a stop-start season. Hereford United vs Bradford City, Edgar Street, Saturday 30th April, 3.00pm. Joe Colbeck started his footballing career with Bradford City and so will hope to show them tomorrow how he has progressed since joining Hereford United. Colbeck is a regular in the starting eleven and a contender for player of the season. "Coming here has been a fresh start for me," Colbeck told the Bradford Argus. "The season has not panned out how we would like but it’s been good personally. "I’m playing every game and like to think I’m one of the main men in the team. I’ve always been a confidence player and that sort of responsibility brings out the best in me." Sean Canham is back at Edgar Street after his loan spell at Kidderminster and there is just a chance he might feature for the Bulls in their game against Bradford City tomorrow. Recently manager Jamie Pitman has tended to play Stuart Fleetwood upfront on his own for much of the game, but brought on another striker late on. Jason Price has been that sub on occasions but he is ill and therefore Canham could have a chance tomorrow. Otherwise there are no fresh injury problems for the Bulls. Meanwhile Pitman has said that the Bulls must not rely on others to keep them out of the relegation zone. However Accrington could help the Bulls by defeating Barnet tomorrow. "Barnet have a tough encounter," Pitman told BBC Hereford and Worcester. "But they've had a lot of tough encounters and have come away with good points in recent weeks. "So you can't under-estimate what they are doing at the moment. "Not just them but Lincoln, Northampton and ourselves. "We have to make sure we get the right result here. That's the only thing we can control." Hereford United are 6/5 to defeat Bradford City tomorrow at Edgar Street. This price is available from Victor Chandler and Coral. Best price for a draw is 5/2 with BetFred. Prices haven't changed much since the beginning of the week. Onto the correct result, firstly for a draw. And for an outside bet Stefan Stam is 40/1 with William Hill, SkyBet and Boylesport. All prices from www.oddschecker.com and are subject to change. Readers are asked to consider betting with Coral through the link on the Hereford United OS as it benefits the club. The final home game of the season is upon us and it spells the near end of this season's Prediction League. Can Hereford round off their league campaign at Edgar Street with victory? Entry is simple. Send your final score and attendance predictions to bullsnewspredictions@hotmail.co.uk. Please remember to include your username. The deadline for Saturday's match is at 2.30pm. Bulls News is now on Twitter! The longest running Hereford United news site is now available directly to your Twitter account. You can follow us by clicking here: @bullsnewsblog. BBC Football presenter Mark 'Clem' Clemmit, pictured when Hereford United played at Gillingham earlier this month, is on the lookout for the kind support of his fellow football fans as he gets ready to embark on a challenge of a lifetime. 'Clem', along with the likes of Chris Kamara and Aidy Boothroyd, will climb Mount Kilimanjaro in June to raise vital funds for the Football League's chosen charity for the 2010/2011 season - Marie Curie Cancer Care. The Football League's official charity partner for the 2010/11 season is Marie Curie Cancer Care. The aim is to raise £500,000 to provide 25,000 community nursing hours for terminally ill cancer patients. To do my bit, along with Sky Sports Chris Kamara, Swansea City Manager Brendan Rodgers, Aidy Boothroyd, Middlesbrough Chairman Steve Gibson, Daily Mail columnist Des Kelly and 28 others, I will climb Africa's largest peak Mount Kilimanjaro between the 9th and the 18th of June. As part of my preparations I will drag myself to the gym 3 times a week, undertake a series of training treks and be inoculated against Hepatitis A, Malaria, Typhoid and Yellow Fever. I will spend 8 hours in an economy airline seat to reach East Africa. When we set off we will walk in t-shirts and shorts but by the time we've climbed the 19,341 feet to the top it will be minus 20oc. Along the way we'll sleep in tents, not wash for a week and go to the toilet in unspeakable circumstances. The altitude sickness in the final stages will be so bad that some of us may struggle to reach the summit. For the final 6 hours ascent we've been told to expect the feeling of extreme drunkenness and the worst possible hangover at the same time. I am doing this in memory of my mother who died from cancer at the age of just 58. From diagnosis to death she lasted just 6 months. I have seen at first hand the distress and confusion of a terminally ill patient and their family. I know how important it is that those who are nearing the end are made to feel as comfortable as their situation allows. No pressure, but please give as generously as you can and if you can't, please spread the word. Any Hereford United fans interested in donating can visit http://www.justgiving.com/markclemmit for more details. Bradford Cty need a point from Saturday's match at Edgar Street to ensure they will play League Two football next season. However interim manager Peter Jackson insists he would rather win the game thanrely on others. "It is still a big game for us - it is still a big game for both clubs on Saturday," Jackson told the Bantams OS. "They (Hereford) will be desperate for three points for their own cause, but we will be desperate for the win as well. "We know that we need a point to be mathematically safe. "But it would be nice to collect all three points and we have to go there with the right mindset to look to win the game. "We know that we just can't go there and just try and play out a draw. If we go there and close up shop then that will invite them onto us. "It will get their fans going and give them an extra confidence boost that we don't really need to be giving them." Hereford United's Kyle McCarthy has started for Wales in their under 19 match against Serbia this afternoon. It is the opening match of the Elite Round Qualifiers. Also in the Welsh group are hosts Norway and Moldova. Latest: Wales 2 Serbia 1 at half-time. Further Latest: Wales won the game 3-2. McCarthy played for the full 90 minutes. For their next game Wales take on Norway on Saturday. 12 managers have left League Two clubs this season including the departure of Simon Davey from Edgar Street. Swindon chairman Andrew Fitton has quit his post after their relegation to League Two. When he took over in early 2008, as head of a consortium that took 75% of the club, he announced a '3-5 year plan' to get the club into the Championship. Southend defender Johnny Herd says he expects to leave the club in the summer after an injury hit season at Roots Hall. The 21 year old youth team graduate has started only six games this season. Truro City, featuring ex-Bulls Tom Smith and Alex Jeannin, have won the Zamaretto League Premier title and will compete in Conf South for the first time in their history. The club plan a new stadium to replacing their Treyew Road ground that has seen them rise up through the leagues over the last six seasons. Bristol Rovers have it written in their players' contracts that they will have a 20% cut in wages should they be relegated from League One. Arlesey Town won their Zamaretto One Central league for a second time on Monday by beating Hitchin, but it was revealed their points deduction was over an unpaid £25 fine to defender Cameron Mawer that went unpaid after the forms were sent to his old home. Port Vale bidders Mo Chaudry and Mark Sims have withdrawn their bid after the club's board failed to meet their latest deadline. They say they will now wait for the EGM before deciding on their next move. Cambridge have offered caretaker boss Jez George the manager's job for next season. The U's say they will be cutting their playing budget by 25% in a bid to break even after suffering heavy losses this season. Swindon have parted company with temporary manager Paul Hart and coach Charlie McParland. The Robins have put reserve team coach Paul Bodin in charge for the remainder of the season. Aidan Thomas and Sam Gwynne featured for AFC Telford as they lost 1-0 to Shrewsbury tonight. The Shropshire Senior Cup ended up as a clash between two reserve sides, with the Shrews fielding none of the starters from either of their weekend matches. Thomas played the full 90 minutes for Telford, with Gwynne playing the last 15 after replacing ex-Bull Danny Williams. Hereford United have dropped some prices for next Saturday's game against Bradford City in an effort to get as much support into Edgar Street as possible. Terrace prices will be £10. Under 16's can 'stand' for just £1. There are no reductions for those who wish to sit and watch the game nor for season ticket holders. Coral is currently offering the best price for a Hereford United victory over Bradford City on Saturday. Their price of 6/5 compares with a general offer of 11/10. Best price for a draw is 5/2, on offer from BetFred. A win for Bradford is priced at 12/5 with Bet365. It appears that British Land is the favourite to fund Stanhope's development of the livestock market which adjoins the Hereford United football ground. Property Week reported last week that British Land are in advanced talks for an £80m forward-funding of Stanhope’s first shopping centre scheme, the Old Livestock Market in Hereford, where development is due to begin in 2012. The street-plan shopping centre is around 50% prelet by area, including an 85,000 sq ft three-storey department store, a 23,000 sq ft Waitrose food store and a six-screen Odeon cinema. On completion in autumn 2013, British Land would own the scheme. Its predicted value is £90m. One other party is in talks with Stanhope, but British Land is believed to be the preferred funder and is likely to enter exclusive talks in the next week. The implication, assuming the story is correct, is that Stanhope will make £10m out of their involvment in the Hereford project. Note: The British Land Company PLC (British Land) manages, owns, finances and develops commercial property. Its focus is on the retail and office Sectors. Its retail portfolio consists of 15 million square feet of space (Group share), including 93 retail warehouse properties, 102 superstores and 10 shopping centers. Its Office portfolio is focused on assets in the City of London and West End. Torquay United are not expected to appeal against their one point deduction for playing an unregistered player against Hereford United last February. The Herald Express reports that the Gulls have a board meeting today which is likely to confirm the decision. Torquay are outside a League Two play-off place by just one point but the paper suggests that should they appeal to the Football League, the club doubts they will change their mind. Given their view and decision, in effect, to accept their one point deduction it seems unlikely Hereford United will appeal against their three point deduction for playing Rob Purdie in the same game. The Bulls didn't have the correct paperwork about his new deal with the League within the correct time frame. Club Chairman, David Keyte, has 28 days from the date of the decision, April 6th, to decide whether to appeal. In truth, whatever Torquay's view, there will be little point appealing if the Bulls can avoid relegation. However Keyte's decision will have to be made before the final game of the season has taken place. Another reason why a win for the Bulls next Saturday against Bradford City is so important. Barnet will be without striker Steve Kabba for the rest of the season due to the knee injury that has kept him out for the last two games. The former Sheff Utd man has 11 goals in 25 games this season. Port Vale fans claim that they have pledged of nearly 1,600 season ticket holders that will not renew their tickets under the current board. The board have another week to call the EGM demanded by shareholders. No Bulls in the Team of the Week. Morecambe goalscorer Will Haining is nominated, while Bury are the only side to have two players nominated. Lincoln are offering free coach travel for their match at Oxford on Saturday. The offer is being funded by the club's chairman, vice chairman, and a prominent supporter. Forest Green chairman Dale Vince is subsidising coach travel for their crunch final game at Tamworth on Saturday. The two sides are level on points on the edge of the relegation zone, with the Gumpers needing a draw to secure their Conference status. Cheltenham say they have set their ticket prices for next season in an effort to give Mark Yates an increased playing budget. They have confirmed that matchday prices will rise by £1 for 'certain premium games only' but have not indicated which games those are. Sheff Weds are the latest side to scrap their reserve team, with manager Gary Megson saying he expects reserve team football to be dead within three years across football. Who will play in League Two Next Season? With Hereford United still not safe from relegation, BN takes a look at which clubs are likely to be playing League Two football next season. Whilst Notts County appear to be safe, it's by no means certain who will join Swindon in League Two next season. Plymouth have a game in hand over the other bottom clubs and there recent form has been very good. However they have two difficult matches against Exeter away and Southampton at home before playing Leyton Orient, who currently still have a chance of making the play-offs, on the final day of the season. Southampton could finish second in the League, if not they will be in the play-offs so will want to win at Plymouth. Bristol Rovers have a home game against Sheffield Wednesday then travel to Colchester. Neither of their opponents have anything to play for. Dagenham and Redbridge have to play Carlisle at home and then Peterborough, who are already in the play-offs. Walsall entertain Charlton, who have nothing to play for, on Saturday before a difficult trip to Southampton a week later. 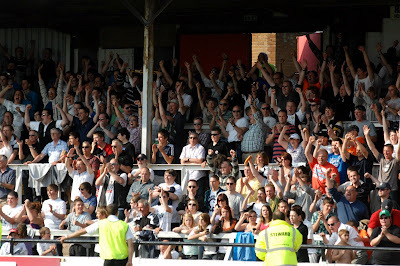 In truth Hereford United, assuming they remain in League Two, would be very happy if Dagenham stay in League One and the other four drop down as they are all likely to bring reasonable support to Edgar Street next season. With Chesterfield and Bury already promoted, it looks as though either Wycombe or Shrewsbury will automatically join them in League One. Then its three out of the next four for the play-offs. Bulls fans would probably prefer Shrewsbury to lose out as otherwise the nearest local derby will be lost for at least a season. Whilst in theory neither Bradford, Cheltenham nor Macclesfield are currently safe (all on 51 points), the chances of one of them going down is, to be blunt, nil. Stockport will be relegated unless they win their last two games by about 15-0 and Northampton lose both theirs. So the Hatters are doomed. However who will join them in the Conference next season remains uncertain. Barnet have a very difficult looking game at promotion chasing Accrington on Saturday and Northampton take on play-offs contenders Stevenage. Lincoln travel to Oxford whose season has, realistically, ended. Burton are at Southend who also have nothing to play for. The form book would suggest that both Barnet and Northampton will find it difficult to take more than a point, at most, from their games on Saturday. If Barnet lose and Hereford take a point against Bradford City, then the Bulls will be safe, similarily if the Bulls win and Barnet draw. But should the Bulls lose, whatever happens to Barnet and Northampton may not matter and it will all be down to the last Saturday of the season. It's quite complicated and Hereford supporters will have to wait until 4.50 on Saturday to see how the results pan out. Finally Crawley from the Conference will be plying their trade in League Two next season. They will be joined by one of the following, Wimbledon, Luton, Wrexham, or Fleetwood. Bulls striker Stuart Fleetwood has taken part in a short question and answer interview with the Football League. Tell us about your debut. Who was it against? How did you play? Most expensive item you have ever bought? Perfect woman - apart from wife/partner? The lads are over for dinner, what do you cook? Which boots do you wear? If you were the manager of the club, who would you sign? Best stadium you've played at? If you weren't a footballer, what would you be doing? Tell us something not generally known about you? Best freebie you've ever received? The kitchen in my new house. The guys who built my house are all Hereford United fans. The Bulls have recalled Sean Canham from Kidderminster after their play-off hopes ended. Canham scored twice in 12 games for the Harriers, playing as a second half sub in recent games. The former Notts County man is contracted at Edgar Street for next season. David Phillips from Sussex will be at Edgar Street on Saturday to take charge of the match between Hereford United and Bradford City. It will be his second game this season involving the Bulls. His first visit this season was on March 5th when Hereford lost 3-0 to Bury. He booked both Kenny Lunt and Harry Pell that afternoon. Saturday will be Phillip's third game in charge at Edgar Street. 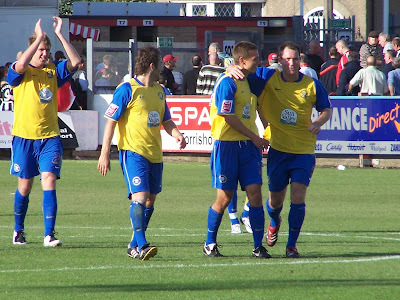 The first one was in November 2008 when Hereford defeated Cheltenham 3-0. To date this season Phillips has refereed 31 games in which he has given out 11 yellow and 7 red cards. Meanwhile Mr Bull will be the fourth official. Yeovil Football club have confirmed that Stefan Stam can remain on loan with Hereford United until the end of the season. The central defender has been a useful addition to Jamie Pitman's squad in the battle against relegation. It's thought he might like to stay at Edgar Street next season if offered a contract by the Bulls. Stam missed last Saturday's match against Shrewsbury but played at Morecambe yesterday. A man has been arrested after Bury keeper Cameron Belford was punched after fans invaded the pitch during their win over Chesterfield. The Spireites have promised to ban indefinitely any offender and are studying CCTV evidence. Chesterfield have been handed the Groundsman of the Year title for League Two, with Shrewsbury and Bradford highly commended. Lincoln are to trial Newcastle defender Daniel Leadbetter and Grimsby midfielder Serge Makofo in a reserve match this afternoon. Swindon boss Paul Hart says he is yet to decide on his future after their relegation from League One. Conference new boys Alfreton, led by ex-Bull Nicky Law, have announced a three year plan to transfer to full-time status and challenge for promotion to the Football League. Mansfield chairman John Radford says he'll put £2million into the playing budget for next season if he secures their Field Mill home from former chairman Keith Haslam. Radford tells the Non-League Paper the club will 'go for it big style'. Grimsby recorded a gate of just 4,311 after expecting 6,000 yesterday after telling fans to pay what they wanted. Wrexham are claimed to have raised the funds to cover their tax bill. Politicial John Marek says the club will pay off the bill in time after securing sufficient funds, without saying exactly where those funds had come from, but he also took a swipe at the Supporters Trust who had turned down a request for funds. Port Vale fans are planning a funeral march for their final home match to protest at the board. Sources say the Valiants have sold less than 200 season tickets for next season, a fraction of the sales figure from last April. In his post match interview Morecambe coach Jim Bentley praised the performance of Hereford keeper Adam Bartlett. "It looked like it was going to be one of those days for a while because their keeper was having a superb game and we were on top when we conceded which is something we have done quite a bit this year," said Bentley. "But the lads deserve a lot of credit for the way they battled all the way in the second half and continued to put them under pressure and I don't think anyone can say we didn't deserve the point and we could have perhaps gone on to win it." For the first time since moving from Christie Park, Morecambe hosted Hereford United at their new ground now called the Globe Arena. Like many new grounds it's a little bit further out of town, there's no parking for visiting fans (not a big problem however), doesn't have a decent chip shop nearby, and there's just one pub within easy walking distance, but once inside it did have more a 'feel' to it than some others the Bulls visited in recent years. There was just one entrance to the ground and the away fans turnstiles were easy to find, just on the right. And one behind each goal but the fourth side was a narrow uncovered terrace. In truth, for the size of the club it was perfectly adequate. The views were good whether behind the goal or sat in the main stand and the Hereford supporters could make themselves heard. One minus point, the pies were the worst anywhere in League Two this season. However the coffee was excellent. The Hereford support was swelled by a group from north of the border. And on another very warm day, one decided to bring his beach gear into the stadium. There was no doubt who was the Hereford United man of the match this afternoon at Morecambe. Without Adam Bartlett's performance in goal, the Bulls could have lost the game by several goals. "I think it was my best game in any shirt to be honest," Bartlett told BBC Hereford and Worcester. "It went well personally. "As a team I think if you had said before kick-off would we have taken a point from the game, I think we would have. "It's a little bit quiet in the changing room because being 1-0 up and getting to the 70 minute mark we wanted to hold on and see ourselves all but safe." Keith Hall asked Bartlett how he managed to save a bullet header from Stuart Drummond. "I don't know," was Barts reply. "I just managed to get my right hand on it but after I got hold of the ball, after a little scramble I looked and the offside flag was up. "I'm just happy to do my job for the team." Hall then talked about what he described as the save of the season - Phil Jevons's volley from about six yards. "I think that was the one five minutes into the second half. If they had scored then, being the home side they were going to have their backs up and it would have been hard from there. Thankfully I made the save and we've come away with a very valuable point." Meanwhile Morecambe coach Jim Bentley said: "Their keeper had a superb game." Hereford United remain three points above safety after a 1-1 draw at the Globe Arena against Morecambe. Despite Steven Leslie's goal a few minutes shy of half-time, United were thankful to have Adam Bartlett in the sticks, with the 'keeper making a number of excellent saves, before finally being beaten by Will Haining. The crowd of 2016, on a delightfully sunny afternoon will be content with the final result, although the 194 in the away end perhaps feeling the happier out of the two sets of fans. Kevan Hurst's free-kick was struck straight at Bartlett, after Michael Townsend had given away a soft foul 30 yards out, before the lively Leslie set up Rob Purdie in the centre of the field but a rasping drive failed to trouble Barry Roche. Strong wing-back work from Joe Heath saw the Exeter loanee get to the byline, cutting back to Joe Colbeck, who couldn't keep his shot down whilst a header from the edge of the area by Stuart Drummond failed to trouble Bartlett. A looping shot from Leslie was off-target before the hosts had two good opportunities in the space of two minutes. The first of these was presented to them after a misplaced pass by Purdie, allowing Danny Carlton to break and his pass found Phil Jevons, who shifted inside Ryan Green before firing just past the far post. Moments later, Jevons was involved, capitalising on a communicational mix-up by Townsend and Stefan Stam, poking the ball through to Carlton but he could only scoop wide under pressure from Bartlett. Good work down the right-wing by Nicky Featherstone saw the former Hull midfielder pick out Kenny Lunt, who sent a strong strike towards goal which Roche had to parry behind for a corner. United took the lead in the 42nd minute through Leslie, although they could have been one down minutes before when Drummond went close. A free-kick from the right was put in the danger area by Hurst, with Drummond rising highest, only being denied by an excellent reflex save by Bartlett. Yet, soon after, Jamie Pitman's men were at the other end celebrating the opener. Colbeck broke inside his own half before sprinting forward and picking out Leslie, with a right-foot pass. The Shrewsbury winger cut inside his man before shooting with his weaker foot through Roche, who in truth should have done better. In the final minute of the opening period, Garry Hunter sent a half-volley from 20 yards past Bartlett's post. The home team start the second-half well with an early chance to equalise falling to Jevons. A ball from the left wasn't cleared, and Carlton hooked it towards the former Huddersfield striker; with plenty of time, he sent a powerful side-foot volley towards the corner from six yards but was somehow denied by an incredible stop by Bartlett. At the other end, Lunt found Fleetwood 25 yards out with the sole striker firing off-target. An unfortunate female Bulls' supporter was on the wrong-end of a misplaced Hurst shot, with the ball striking her on the head and knocking her off her feet. The Bulls were once again thankful for Bartlett's brilliance as he made another fine save. A spot of head tennis inside the box eventually saw the ball fall nicely for Nile Cowperthwaite, and a right-foot lifted volley looked to be heading in the top corner but the outstretched hand of Bartlett clawed it behind for a corner. The former Kidderminster shot-stopper was finally beaten with 20 minutes remaining; a defensive header out of the box was latched on by Carlton at the byline, with a cut-back finished from 10 yards by Haining. Sammy McIlroy bought on Chris Shuker for Hurst, as the hosts pushed for a winner and the ex Tranmere winger was soon involved, sending a through ball to Carlton, but he was smartly denied by the outrushing Bartlett. Waide Fairhurst replaced a tired and frustrated figure in Fleetwood, whilst Morecambe introduced both James Spencer and Andy Holdsworth late on, in place of Carlton and Jevons respectively. A persistant run by Leslie eventually allowed the ball to break into the path of Fairhurst, with the loanee firing goalwards but failing to trouble Roche. In the final moments of normal time, Shuker controlled a long-throw but Brown sliced a shot harmlessly wide, after a through ball had found him. A point a piece at the end of game was a pretty fair result, although Hereford had to defend for large chunks of the second-half. Man of the match Bartlett had an excellent game, with his save to deny Jevons being among the best saves I've seen in 13 years of watching the Bulls. Similar to previous games, chances for United were few and far between, with the formation working well defensively, but too often, lacking numbers in the final third, leaving Fleetwood isolated. Next up for Hereford is the visit of Bradford; a result in this game is a must with safety still far from guaranteed. Hereford: Bartlett, Green, Townsend, Stam, Heath, Colbeck, Lunt, Purdie, Featherstone, Leslie, Fleetwood (Fairhurst). Subs not used: Hoult, Kovacs, Rose, Valentine, McQuilkin, Patulea. Morecambe: Roche; Haining, McCready, Wilson, Cowperthwaite, Brown, Hunter, Drummond, Hurst (Shuker ), Jevons (Holdsworth), Carlton (Spencer). Subs not used: Jones, Bentley, Shuker, Hendrie, Aley. Three tremendous saves from Adam Bartlett allowed Hereford United to take a point from Morecambe this afternoon, a point well-made by manager Jamie Pitman. "There were a few anxious moments," Pitman told BBC Hereford and Worcester. "After all the great saves that Adam had made we were just hoping to hold on but they just nicked a decent finish from the lad at the end. "Adam keeps telling me he has got a great teacher in Houlty. And he has come on since Houlty has been here. "I've got to say he's pulled off three unbelievable saves today." Steven Leslie put the Bulls ahead just before half-time. "We looked a threat on the break first half more so than probably second half. They had more possession second half. "They had a few moments, we've had a couple others. Better decision making we might have got something ourselves." Sean Canham was a second half sub for Kidderminster as their play-off hopes ended with a loss at Rushden. He was booked in injury time as the Harriers had a man sent off. Gloucester came back from 2-0 down to draw 2-2 with AFC Telford. Sam Malsom and Tyler Weir started the game for the Tigers, with Malsom being subbed shortly after half time, and Sam Gwynne came off the bench late on for the Bucks. The game attracted 702, 357 home and 345 from Telford. Below are the main stats from this afternoon's League Two match between Hereford United and Morecambe that ended 1-1. Stockport now require snookers to stay out of the Conference after drawing their crucial match with Northampton 2-2. They are six points behind the Cobblers, with two games left, and with a 35 goal backlog to overcome. The Cobblers are on 46 points, one ahead of Barnet with the Bees drawing 2-2 with Oxford. Lincoln are on 47 after their 2-0 home loss to Cheltenham, and have now scored only once in five games. The Bulls are next on 48 points with Burton a point better off after drawing 3-3 with Torquay. Bradford join Cheltenham and Macclesfield on the 'safe' total of 51 after beating Aldershot 2-1, but they could all go down on goal difference still. At the top Bury join Chesterfield in League One after the Shakers beat the Spireites 3-2, cutting the gap at the top to two points. Wycombe are back into third after beating Crewe 2-0, with Shrewsbury drawing 0-0 with fifth placed Accrington to slip back into a play-off spot. Stevenage are next after beating Port Vale 1-0, leaving the Valiants play-off hopes over, while Gillingham ended Rotherham's hopes after winning 1-0 at the Don Valley Stadium. Torquay are realistically the only side that can displace anyone out of the top seven. In the Conference Crawley set the record for the longest unbeaten run after their 1-0 win at Newport. Wrexham and Fleetwood will join AFC Wimbledon and Luton in the play-offs after the Dragons beat Tamworth 4-2 and Fleetwood beat Barrow 1-0. Kidderminster's hopes are over after losing 2-1 at Rushden. Down the bottom Forest Green's goalless draw with Wimbledon keeps them out of the bottom four on goal difference. At the foot of League One Swindon are relegated after losing 3-1 at Sheff Weds. Plymouth need to make up only three points after beating MK Dons 1-0, and they still hold a game in hand. Bristol Rovers and Dagenham hold the final two relegation spots after Walsall drew with Oldham to move a point clear of the pair, who both lost today. The Bulls drew today's League Two match with Morecambe 1-1. Adam Bartlett pulled off a quartet of fine saves to prevent the safety gap shortening but could do nothing when Will Haining cancelled out Steven Leslie's opener. Wrexham's Supporters Trust has officially launched a bid to buy the club. They are looking for donations, and private investors, to provide the estimated £1million they need to secure the purchase of the club and safeguard its financial future. The Trust would issue shares to investors, but the club's ground would be 'asset locked' against commercial development. Barnet are trialling Ware winger Davie Edmee. He played in a trial side last Saturday. Rushden have announced they will not produce a matchday programme for today's game with Kidderminster after their printers demanded full payment of their outstanding bill at the last minute. The cash-strapped club say they were left with no choice, but will now face further punishment from the Conference as producing a programme is a requirement of the competition's rules. Kettering have issued winding up proceedings against one of their sponsors after they refused to pay their bill. The company, owned by TV 'dragon' James Caan, told the club they wouldn't settle the bill until June after promising payment - late - in mid-March. The club's official statement has issued phone numbers for people to contact Caan directly. Torquay have lost the services of Ipswich forward Ronan Murray after Paul Jewell opted to recall him. Port Vale caretaker boss Mark Grew has written in his weekend programme notes that the FA have ruled that racist chanting could be hear on video evidence from the fateful Accrington match that proved to be Jim Gannon's last. There is not indication as yet what punishment the FA will dish out for the incident said to be against loanee Exodus Geoghaghon, with the Valiants board being 'unavailable' to give comment to the press. Whilst losing to Shrewsbury Town was alwaya a possibility, what wasn't expected on Saturday was that the three teams at the foot of League Two would all win their matches and therefore put pressure on Hereford United to take all three points at Morecambe this afternoon. The Bulls are in 20th position in the table with 47 points. Three points from the Globe Arena will, in all probability, be enough to remain in the League. The Bulls will have winger Steven Leslie available again this afternoon, but it's not certain whether central defender Stefan Stam will be fit enough to play. He has travelled to Lancashire with the rest of the squad but reportedly faces a late fitness test. For those unable to be at the game which is the first for Hereford United at Morecambe's new stadium, there will be full commentary on BBC Hereford and Worcester's 94.7AM frequency with Keith Hall behind the microphone. The Bulls Player team will also be at the game. 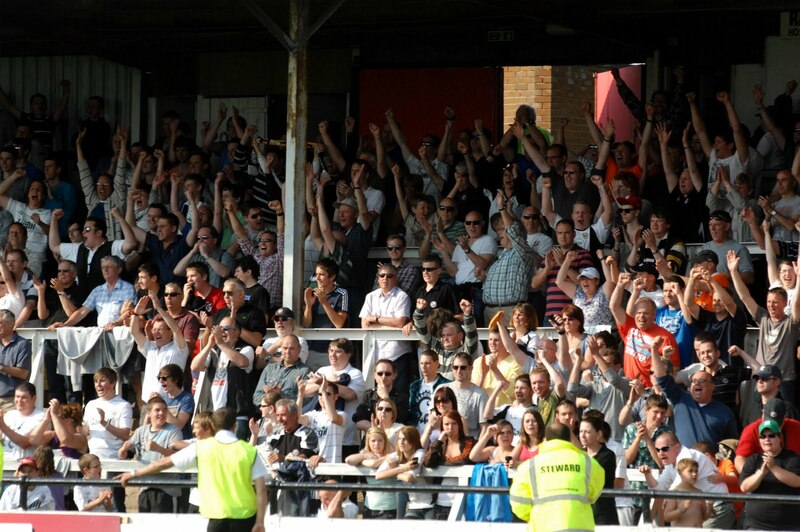 Over the weekend the price available for a Hereford United win at Morecambe has firmed from 21/10 to 9/4. It's assumed this may be as a consequence of their defeat by Shrewsbury on Saturday. The price of 9/4 is available with SkyBet, Stan James and Victor Chandler. Best price for a draw is 5/2 with Victor Chandler. and finally James McQuilken is 20/1 with Coral. All prices from www.oddschecker.com and are subject to change. Readers are asked to bet with Coral, whenever possible, through the link on the Hereford United OS as this benefits the club. 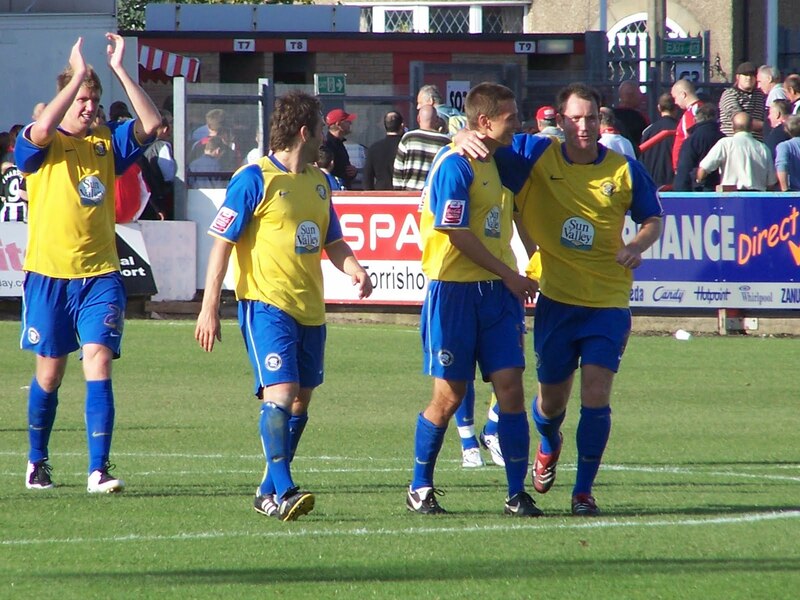 Back in September 2007, Hereford United travelled to Morecambe and came away with a 3-0 victory. On that day Mark Haywood was the referee and he's in charge again when the two teams meet tomorrow. Hereford United struck three goals in the last ten minutes to overcome newly promoted Morecambe at Christie Park this afternoon. Trevor Benjamin opened in the 80th minute with a header, before Lionel Ainsworth and Luke Webb confirmed the win with late strikes; the victory sees United move up to fifth in the table, the same position they have been in after their previous two away victories. There was only one change to the starting line up from last weekend's defeat against Macclesfield, with Trevoe Benjamin replacing Theo Robinson, who was ill. Sam Gwynne, Webb and Simon Johnson took places on the bench. Trent McClenhan was still unavailable due to international duty, with Richard Rose again deputising at right back. Lining up for the opposition was ex Bull Craig Stanley, who opted to join the Northeners after Hereford's play-off victory, just over a year ago. Once rumoured target of Graham Turners', Jim Bentley, lined up as captain for Morecambe, and received the player of the month award before the match started. The early signs showed promise for Hereford, with Ainsworth again finding good rhythm down the right hand side. He burst from the half way line before firing wide from the edge of the area, whilst at the other end, Stanley shot weakly at Wayne Brown. Ainsworth then leapt well to meet a Steve Guinan flick but his header went harmlessly over. A powerful header from Dave Artell caused United problems in the area, but Guinan had time to control before volleying clear to safety. A determined Stanley also had a good opportunity from a set piece, but his flick was caught by Brown. Both sides were finding space, but were failing to create any real chances in front of goal. Carl Baker's long range effort went harmlessly wide, before Morecambe wasted their best chance of the half. Garry Thompson beat Kris Taylor on the right wing, before hanging a cross to the back post, where Matthew Blinkhorn pounced, but could only head wide from a good position. At the other end, Taylor found himself attacking, and crossing for Guinan to head into the side netting. Just before half time, Benjamin powerfully struck a shot after good work from Ainsworth, but the keeper wasn't troubled. The start of the second half was very poor, with neither side threatening. Ainsworth tamely shot at Joe Lewis, whilst free-kicks from both Taylor and Ainsworth again failed to trouble Lewis. One may argue that the changing point of the game occured when Michael Twiss was introduced in place of Stanley; the midfielder was playing extremely well, working hard both defensively and attacking-wise, and the decision to switch to two up front left a large gap in midfield which The Bulls exploited. However, things could have been much different if Damien Allen finished from close range. Twiss skinned Rose before cutting back for Allen, but he could only find the back of the stand, instead of the back of the net despite being in a fine position. Hereford had plenty of possesion in the second half, but all too often, the final ball was letting them down, or players were dwelling on the ball. Then came the defining moment. Guinan held the ball up in the box, and played a neat ball to the feet of Ben Smith, who had ran into the box. Smith dinked a cross to the back post, and it was met bravely by the stooping Benjamin to knock in his third goal of the season. Morecambe tried to respond by bringing on two attacking players in Jon Newby and Garry Hunter, in place of Neil Sorvell and Blinkhorn, but the goal had lifted Hereford and they looked like adding a second. Benjamin's clever back-heel fell in the path of Smith, who shot inches wide with his left foot. Just a minute later though, and United made it two. A long ball was chested down by Benjamin, and Guinan linked up with Benjamin, who sent a through ball to the chasing Ainsworth. The winger used his pace to devastating effect, before putting the ball out of the reach of the on-rushing Lewis, and into the back of the net. With the win seemingly wrapped up, and five minutes remaining, Simon Johnson made his league debut, replacing goalscorer Benjamin, and he used his pace to good effect as the game became very open late on, by running the channels. Webb then replaced the other goalscorer Ainsworth for a short run out. A free-kick for Morecambe resulted in an Artell head on target, but Brown was equal to it, whilst Johnson perhaps should have done better after racing through to meet a Smith pass, but only shooting at Lewis. Deep into injury time, United put the icing on the cake when an Easton header released Guinan down the left hand side, and he put a good low ball into the box, and Webb (pictured being congratulated by Guinan after the end of the match) capped his cameo appearence by sliding in to make it three. The victory enbaled United to continue their 100% start away from home, with Benjamin scoring in all three games. The former Leicester and Peterborough man gave a fine second half performance, using his power and ability superbly; player of the month Bentley had no answer for this. 2949 supporters witnessed the late surge by United, although the Hereford contingent was surprisingly quiet by their usual standards. Next up for The Bulls is a tough looking home match against Bradford, who overcame Peterborough 1-0 at Valley Parade today. Subs: Ingham, McCombe, Gwynne, Webb, Johnson. Morecambe, Lewis, Yates, Adams, Artell, Bentley, Thompson, Stanley, Baker, Allen, Sorvell, Blinkhorn. Subs: Drench, Howard, Hunter, Twiss, Newby. After yesterday's home defeat to Shrewsbury, Hereford travel north for a huge match at Morecambe, in search of three points that would put them in a strong position to survive relegation. To enter the Bulls News Prediction League, simply send in your final score and attendance predictions to bullsnewspredictions@hotmail.co.uk. Remember to include your chosen username. The deadline for the match is at 2.30pm on Monday. Good luck! The Bulls are still relegation outsiders despite yesterday's results. Jamie Pitman's men have seen their odds for the drop halved but remain 25/1, the same price as Burton but ahead of four other sides. Stockport, despite their win at Port Vale, are no better than 1/50 with Barnet 8/11 and Northampton down to a season-low of 3/1. Lincoln are 9/1, with Bradford and Cheltenham 33/1 shots. Stockport's fate could be sealed on Monday as they entertain Northampton. Anything but a win for the Hatters would see them relegated, with even a draw leaving them two games to make up six points and a thirty five goal gap to the Cobblers. Gary Johnson's men are now 17 games without a win, but have scored twice in each of their last three games. Three times in their last six games they have scored deep into injury time to salvage draws. Barnet face Oxford at Underhill, with U's boss Chris Wilder acknowledging that his injury hit side will have to be shuffled after losing defenders Djoumin Sangare and Mitch Hanson to injury during Saturday's game. Lincoln entertain Cheltenham having lost their last two home matches 4-0 and 6-0, with ex-Bull Gavin McCallum blaming jeering from the home support for their failings. For the Robins it is just two wins in 18 matches. Bradford entertain Aldershot still seeking a win to get them over the 50 point line. Boss Peter Jackson agreed with the fans singing that the Bantams players were 'not fit to wear the shirt' after their 3-0 loss to Accrington. The Bantams have scored only once in four matches, conceding eleven times. Burton entertain Torquay on the back of a three match unbeaten run that has yielded seven points. Bradford co-chairman Mark Lawn has denied 'sabre rattling' in his negotiations to reduce the rent at Valley Parade. The club wants to restructure payments so that they will get discounts while they remain in League Two but former chairman Gordon Gibb, whose pension fund part-owns the stadium, has not responded to their requests for talks. If Gibb fails to negotiate it is feasible that the Bantams would enter Administration later in the summer to release themselves from their leases on the ground. Midlands football managers and chairmen are calling for a reorganisation of the tiers below the Conference to ease the travelling costs currently involved. They want either a Conf Midlands to join Conf's North and South, or a split of the Ismithian, Southern, and Northern leagues to six regional zones covering more specific areas. 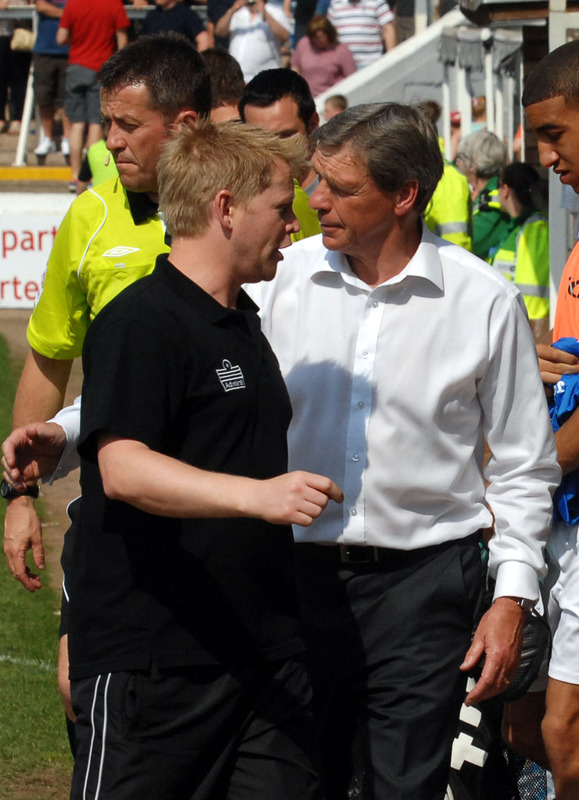 Bath City have named manager Adie Britton as their temporary Chairman after Geoff Todd stood down. Britton, who became manager two and a half years ago, joined the board a couple of months ago. Port Vale fansite One Vale Fan has posted a lengthy letter from Mo Chaudry ally Mark Sims. Sims, a former club sponsor, has joined with Chaudry to bid for the club but in his letter he notes his disappointment that the current board has not responded to their joint offer, and warns them that they will be humiliated at the forthcoming EGM. Valiants fans protested against the board after yesterday's loss to Stockport, with stewards having to remove them from the stadium. 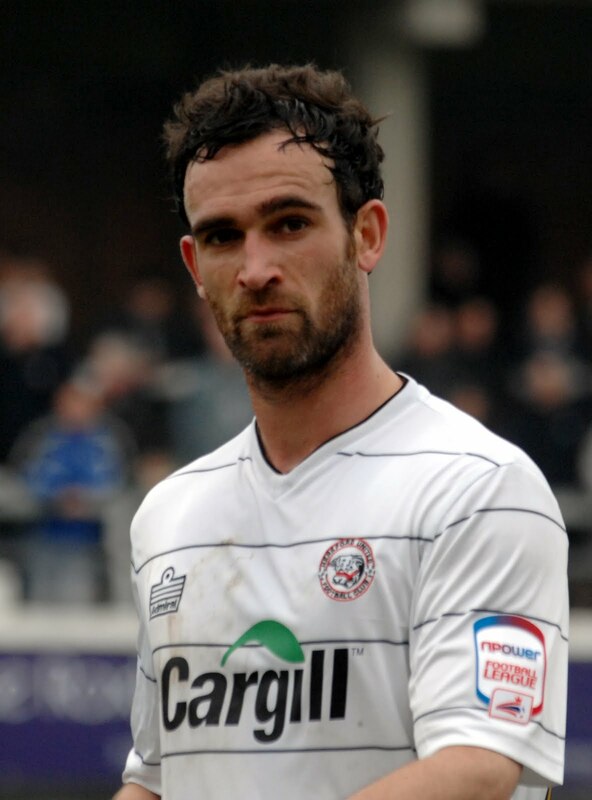 Former Bull Craig Stanley has told Torquay's official site he would like to sign for the club permanently. The 28 year old has made 17 appearances for the Gulls since arriving on loan, but will miss any play-off campaign as his loan runs out before then. Arlesey Town, Bulls FA Cup opponents in 2002, have been docked nine points for fielding an ineligible player in three matches. The penalty has cost them the Zamaretto One Central League title, which they must now win again by beating second placed Hitchin on Monday. A draw would see Hitchin lift the championship. Wrexham have been told there is no threat to their Conference play-off participation as long as they stick to the time line submitted to the Conference on how their court date with the taxman will play out. Mark Haywood from West Yorkshire is set to referee tomorrow's League Two match at Morecambe where Hereford United are the visitors. The Bulls have met Haywood once this season. That was the away game at Shrewsbury which was lost 4-0. To add to the defeat, Ryan Green was sent off for a strong challenge on Matt Sadler. Haywood has been in charge of 34 games this season and has given out 62 yellow and just 2 red cards. Meanwhile anyone fancying a pound on a Hereford United win at Morecambe can get odds of 11/5. A big police presence around Edgar Street and also in parts of the city centre ensured that there was little trouble between rival sets of supporters. Before the game police were on hand as Shrewsbury supporters made their way from the Railway Station to Edgar Street many calling in at several pubs on the way. There was a report of a problem in Morrisons but this was quickly dealt with. There were dozens of police particularily in Blackfriars Street as a fleet of coaches brought many other Shrewsbury supporters to the game. Inside the ground four Shrewsbury supporters were ejected from the family area of the Merton Meadow stand after alert Hereford supporters pointed them out to the stewards. After the match ended many Shrewsbury supporters were held back whilst Hereford supporters dispersed. And the West Mercia force helicopter circled above. Hereford United manager Jamie Pitman gave Shrewsbury some credit after their 2-0 win at Edgar Street this afternoon. "Their two goals were poor from our point of view but it was a tighter game than the scoreline reflects," Pitman told BBC Hereford and Worcester. "But we have to give Shrewsbury some credit, they have come here and set about us but they did show us some respect. "They're third in the league for goodness sake and don't concede goals and are a force to be reckoned with, while we're fifth or sixth from bottom. "We've had our moments in the game but their two goals were poor from our point of view. "We've been under pressure all season and we go into the next three games under pressure." Several players were missing today and Pitman was asked by Keith Hall if they would be available on Monday for the Morecambe game. "We're hoping so. Waide has had a bit of tonsilitis, Jason Price has got bronchitis he had to sit on the bench, Ryan Valentine has just come back from injury, he's to sit on the bench, Dan Strafford has had a bereavement. "People shut 'put on subs' but those lads were struggling themselves." Stefan Stam also missed the game with a groin injury. "He's a big loss, he's a good player." Hall then asked Pitman if he would give credit to John Trewick and Graham Turner's side this afternoon. Jamie Pitman and Graham Turner having a few words - picture from Andy Compton of the Hereford Journal. "I give credit to Graham Turner, yes I do. They've got a decent side, their budget is probably two to three times the size of ours. And we are trying to compete with them. "And that's probably why there are because they have a massive squad to choose from. And we are where we are."